Texas Roadhouse Cinnamon Honey Butter is the perfect accompaniment to buttery Texas Roadhouse Rolls. Cinnamon, honey and butter are a match made in dinner roll heaven. Have you ever been to Texas Roadhouse before? Much like the best thing about Red Lobster being the Cheddar Biscuits, by far the best thing about Texas Roadhouse is the hot, buttery dinner rolls. If you haven’t had a chance to indulge in Texas Roadhouse Rolls before, let me tell you the secret to them: honey. Both in the rolls themselves (a whopping 1/2 cup, which is a lot of sweetener as far as dinner rolls go) and in the accompanying Cinnamon Honey Butter. Let’s ponder that phrase for a moment. Cinnamon. Honey. Butter. I mean, sure – you can eat Texas Roadhouse Rolls without the Cinnamon Honey Butter and they’ll be delicious. You could opt to serve the rolls with jam, or Apple Cherry Butter. They’ll be delightful, in fact. 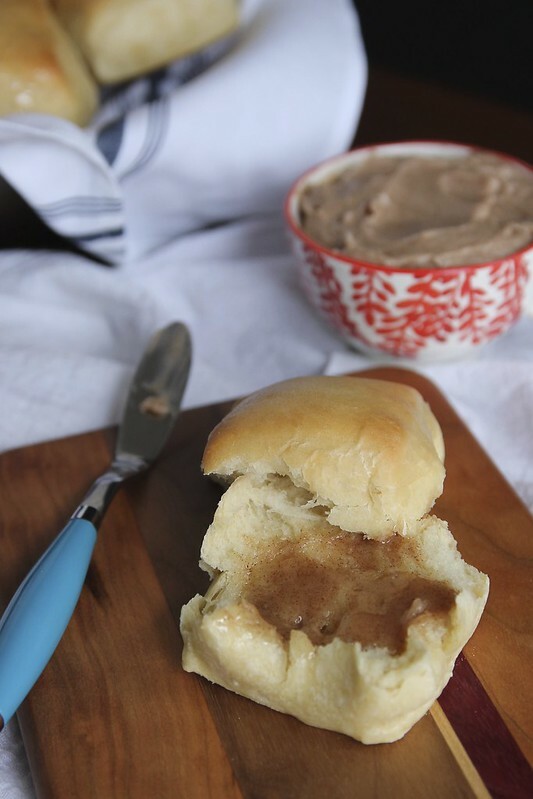 But if you really want to take things over the edge (and I know you do when carbs are involved – we’re friends, so I’m assuming we’re the same like that), you’re going to need to slather those warm rolls in the delight that is Cinnamon Honey Butter. In fact, I’m pretty certain I don’t want any other type of butter in my life ever again. In my personal opinion, the key to making Cinnamon Honey Butter is to not overcomplicate it. I’m serious, you guys. Cinnamon, honey and butter. That’s all you need. I’ve seen some recipes that use powdered sugar, and I have to be honest that I just can’t get on board with it. I prefer to get all of the sweetness from the honey, which also brings way more flavor to the party than powdered sugar would. Making Cinnamon Honey Butter is just as easy as making any compound butter. Make sure your butter is softened. Then use a mixer to whip it together with the honey and cinnamon. Of course, if you don’t have an electric mixer, you could mix everything together with a wooden spoon. Just know that you might not be able to get it quite as fluffy and smooth. But put some muscle into it. It’ll be worth it – the best things always are. Of course, you don’t have to serve Cinnamon Honey Butter only alongside Texas Roadhouse Rolls. You could put it on squash, on sweet potatoes, on toast…the sky’s the limit here! You could also package it up in small jars and gift it at the holidays. If you are hosting Thanksgiving, try making a big batch of Cinnamon Honey Butter and putting it in 4-ounce Mason jars. Store them in the freezer and then send them home with your guests at the end of the evening! Trust me, you’re gonna love this one. In a medium bowl, mix everything together with an electric mixer until well combined. Serve immediately or store in the fridge until ready to serve. Thank you so much for attending week 6 of #PureBlogLove and linking your fantastic blog post. I am loving how easy this butter is, and you cannot go wrong with a combination like honey and cinnamon! I can’t wait to see what you have in store for our party next week Thursday 8 PM EST- Sundays at midnight . Your post has been added to the #PureBlogLove Pinterest board for all to see 🙂 Have a great day! I hope you do and that you swim in that butter because I nearly did!